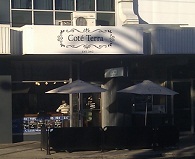 This morning, as is my habit, I called into my favourite coffee shop Cote Terra in Oakleigh, Victoria for my caffeine hit. As I stood there waiting for Joe to make it with his usual artistic flair, this vision appeared before me. Isn’t it great that after sixty years, some Ray Cook (Raynham) ramekins are still going strong. 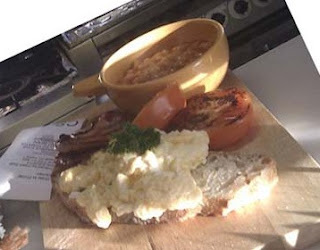 And yes, there are baked beans in it. Just saw a nice set of 6 Ray Cook ramekins at the Hurstbridge Op Shop.